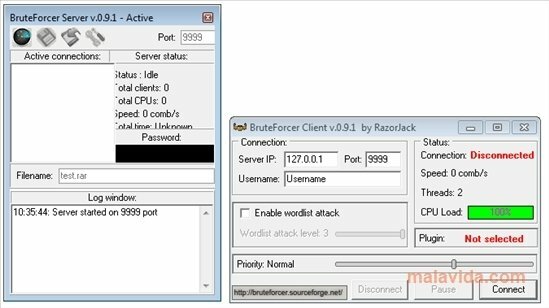 BruteForcer is a program that will do anything possible to find out the password of any file. Furthermore, BruteForcer makes use of the distributed computing techniques to decrypt it. How? 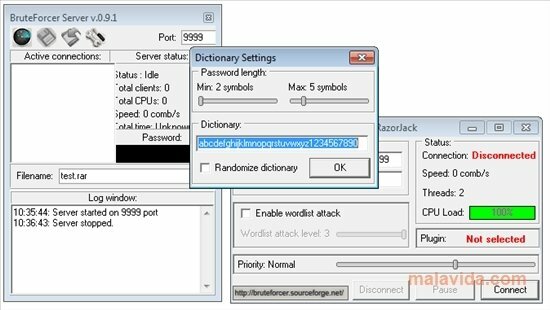 By simply creating a server and allowing various client PCs to process data until they find out the password of the chosen file. Thanks to the fact that it is designed to support plugins, it is very easy to optimize how it works to be able to know the password very quickly. As of now, the plugin used it the most advanced to be able to find out the password of a RAR file, but any programmer will be able to create their own and publish it without problems. Clearly, distributed computing is the most powerful way in which a file protected by password may be attacked, because the most power (amount of clients) that it obtains, the quicker it will be able to try all the possible combinations. 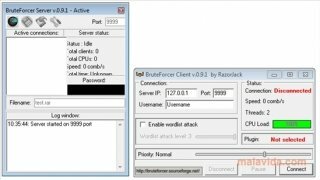 All in all, if you need to find out the password to any file, download BruteForcer for free, specially if you're dealing with a RAR file. This download requires a 7-Zip compatible expander.